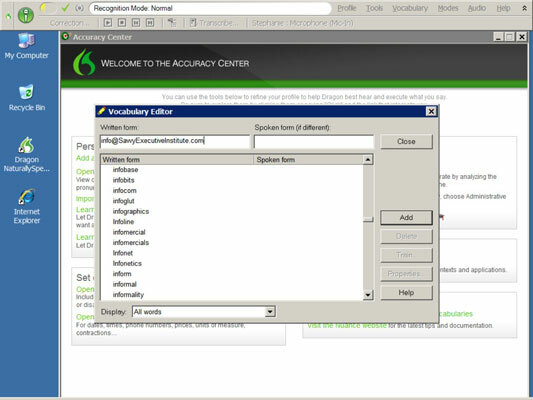 1Enter the term in the Written Form textbox at the top of the Vocabulary Editor. In the figure, for example, the user entered an e-mail address, info@SavvyExecutiveInstitute.com. To see what’s in the vocabulary, you can either scroll the list in the Vocabulary Editor or type the term in the Written Form box. As you type, the list scrolls to match your typing. If you want to speak something other than what’s typed, enter it in the textbox labeled Spoken Form (If Different). For example, now you can simply say, My E-Mail and have NaturallySpeaking type info@SavvyExecutiveInstitute.com. 2A dialogue box may open. Click OK.
3After you enter a written (and, if different, spoken) form of the term, click the Add button. If you think the pronunciation will be difficult, click the Train button and record the word as directed. The Vocabulary Editor adds the term to the vocabulary list and marks it with a plus sign (+). You can delete any custom term you add. Just click the term, then click the Delete button. You can also select multiple terms to delete by holding down the Ctrl button as you click.